Here at PDF, we are saddened to hear about the recent deaths of two remarkable activists who dedicated their lives to social justice, yet heartened by the changes they made and saw on behalf of our communities. Grace Lee Boggs, a revolutionary human rights activist, died at age 100 on October 5th in Detroit. She was a leader in community organizing and political movements for various issues including civil rights, feminism, labor and the environment. She was involved in the Black Power movement and adopted Dr. Martin Luther King Jr.’s nonviolent strategies to strive for economic and racial justice. Grace Lee Boggs frequently spoke on the show, “Democracy Now,” one of PDF’s grantees from 2004. 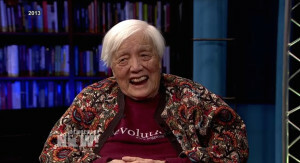 See “Democracy Now’s” transcript featuring Grace Lee Boggs here. Vivian Stromberg, one of the founders of the international humanitarian organization, Madre, died at age 74 on September 24 in Brooklyn. She was an elementary school music teacher who worked tirelessly at Madre to support women’s groups in the United States, Africa, Central America, the Middle East and the Caribbean to provide aid and promote human rights around the world. Madre was also one of PDF’s grantees from 1990. 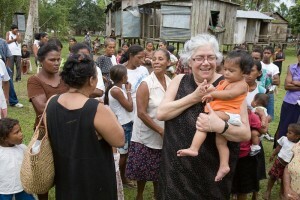 Read Madre’s article remembering Vivian Stromberg here. We are grateful to women like these, upon whose shoulders we stand, who dedicate their lives to making our world a better one for all.